To the memory of one of the ultimate men of men, yet softie of softies, out there. People tell me I'm a ten-year old and some call me a "sort-of Crocodile Hunter." I do not think the two are mutually exclusive. Case in evidence: on a recent trip to Florida, I did some things most over-ten-year-old human beings (so I'm told) would not do. I immediately started looking for lizards to play with. And what did I find on our first full day there? A tortoise (a gopher tortoise, if my nature guides serve me)! It growled at me and retreated into its shell. But I picked it up anyway! Unhappy, it continued its low rumble from inside the shell. It wasn't happy I danced with it. Hitting the beaches, the crabs were plentiful. Therefore, I discovered they do not like being picked up. Come on! What do you expect me to do? Leave them be? I got a few pinches, and one spit at me. Lucky for me, crabs really just make cute little bubbles. The little mouth-like structure builds up a bunch of spittle. I sort of imagine it as yelling obscenities while gargling salt water. And don't worry: I caught myself a gecko by the last day. Or, well, a gecko tail. The gecko itself is somewhere else, looking up his legal rights. Of course, then there's a more obvious comparison to Steve Irwin: I've pet stingrays. How could I accomplish this, you ask? Brookfield Zoo recently provided such an opportunity with Stingray Bay (which is moving on to the Phoenix Zoo now--sorry, everyone!). After passing up the Hawaii-themed gift shop, I was sent to wash my hands and arms up to my elbows. So I could touch them and not get tons of my human grease on them. I discovered the rays like being petted. Find the right spot, they'll slow down and let your scratch them a little bit. 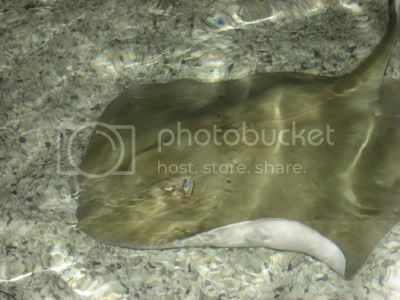 Rays are just like puppies... slimy, triangular puppies. 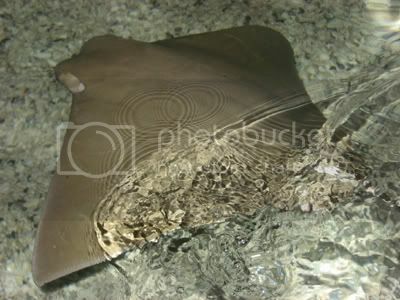 Especially without stingers: the zookeepers kept the rays' tails clipped. We were told they had to regularly clip the tails to make sure the stingers didn’t grow back. The stinger grows back? I hope regular clipping of tails is not the kind of thing keepers forget about. Of course, not all of these slippery puppies were that friendly. Now, you might think this is as stupid as a "Do Not Eat" warning label on a broom, but: don't touch stingrays' tails. They don't like it. I got violently splashed by some ornery ones, just because my dad or I grabbed a tail or two. Ha ha! You have a cow nose! Then came feeding time, which involved buying a $1 worth of raw shrimp and smelt. Holding each bit of seafood in between my fingers, I felt the suction-cup licking. I became even the most ornery of rays' best friend. Definitely not something to miss. It tickled. After probably a few hours (pruny fingers), I smelled of salt, fish, and, for some reason, wet dog. But I learned an important lesson: these creatures aren't to be feared and are in fact quite beautiful! Being able to interact with (and possibly hug) such an animal is a once in a lifetime experience. How many other times can you get a once in a lifetime experience? For this, we return to my latest trip to Florida. We’d seen small sand sharks a few times, none of which I attempted to pet. This built up some Jaws-like tension. Two of my friends were in the water (both are NOT swimmers, by the way), and they were out maybe 50-60 feet: fairly deep. On the beach, we saw a dark shape moving toward them. They didn't notice. Guessing it was a bull shark (very big and very dangerous, unlike the other sharks we saw), we shouted for them to swim in. They finally did, just as I was swimming out to reach them. And what did the dark shape turn out to be? A manatee! So either the manatee wanted to either attack our friends or give them a big hug. I put my money on the hug, so I tried to reach it, but it swam very quickly away from me. Five feet away, and it swam away! My friends told me the crab and turtle probably warned everything else, and the manatee wasn't going to put up with me. This begs the question: all it would take is one well-connected dolphin, and, BAM, I'm banned from the state? Not to mention what that gecko might sue for.